In order to choose the best bike rack, you need to take many things into consideration. Sure, you like the way a certain bike rack looks, but it also needs to meet city ordinances, and more importantly, fulfill the security and convenience needs of those who are actually going to use the bike rack. This buying guide is designed to help you fully understand details like mounts, finishes, styles, and installation tips – all things that are critical to your bike rack purchase. Class I: Think long-term. This type of bike parking is needed where bikes are left for hours at a time. High security, weather protection, and visibility should be taken into account. Good examples of Class I racks are bike lockers or indoor storage rooms with bike racks. Class II: Think short-term. This type of bike parking is necessary in locations where bikes are parked for less than two hours. Convenience and location are the main factors, while shelter from the weather is not as important but should still be considered. In-ground mounts are the most secure way to mount your bike rack. 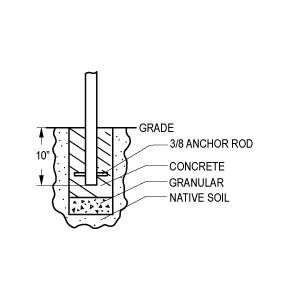 The steel tubing of the bike rack base is vertically planted 10" into the ground, and is stabilized by a 3/8" perpendicular anchor pin. When should I opt for this mount? : In-ground mounts are most beneficial if you're looking for a permanent installment with maximum defense against theft and vandalism. 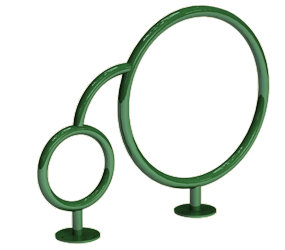 Optional Grout Covers: Optional grout covers can be ordered with round tubing bike racks to conceal the insertion point into the surface, protect from theft, and add to the visual appearance. Surface mounts secure flanges on the bike rack base onto existing concrete using 9/16" lag bolts. 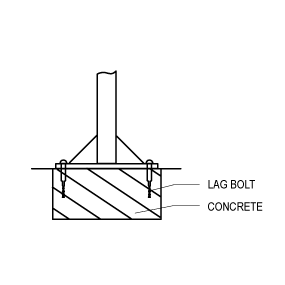 Flanges are either round, square or rectangular, depending on the bike rack style. Surface mounts are stable, but can also be removed and re-mounted to relocate the bike rack. When should I opt for this mount? : Surface mounts are most beneficial if you have a pre-existing concrete slab or are looking for a stable installment but relocation is a possibility. Optional Grout Covers: Optional grout covers can be ordered with round tubing bike racks to conceal flanges and lag bolts, protect from theft, and add to the visual appearance. 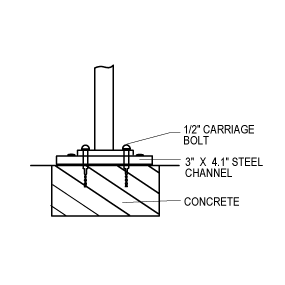 Gusset mounts are surface mounts with extra triangular brackets reinforcing the connection between the tubing and flange. The support pieces add to the overall front-to-back strength of the structure. When should I opt for this mount? : Gusset mounts are most beneficial for high volume racks that support a lot of weight. The brackets will help sustain the integrity of the bike rack and may help increase longevity. 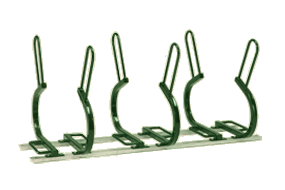 Rail mounts are used when installing 'U' Racks on Rails. The steel tubing is mounted to the 3" x 1/4" steel 'C' channel with 1/2" carriage bolts. 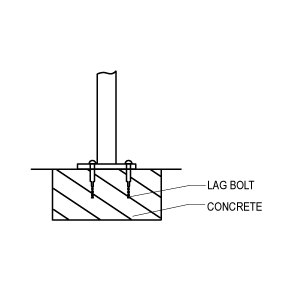 The rails can connect multiple racks, and the carriage bolts anchor the rack into existing concrete. When should I opt for this mount? : Rail mounts come as options with 'U' Racks and are most beneficial if you need multiple 'U' Racks, but want to minimize mounting labor costs or damage to surfaces. 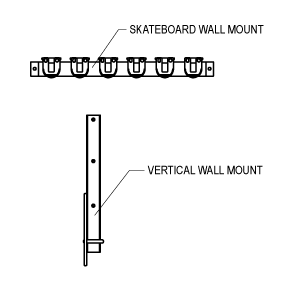 Wall mounts are available for Skateboard Racks and the Vertical Wall Mount Bicycle Storage Rack. These racks can be mounted to the wall of your choice to help conserve space in your storage area. When should I opt for this mount? : Wall mounted bike racks are most beneficial if your bike storage area is lacking in floor space or the ground is not solid. 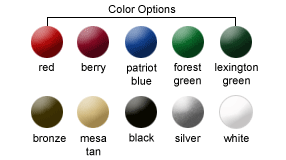 The galvanized finish is the best basic value option. The bike rack is dipped in an 860۫۫۫ F molten zinc bath to give it a thin coating for corrosion protection, and gives the bike rack a muted gray appearance. 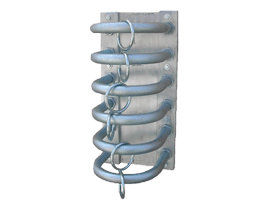 The powder-coat finish is achieved with a free-flowing, dry powder coating that is applied electrostatically and heated to create a tough, protective outer layer. 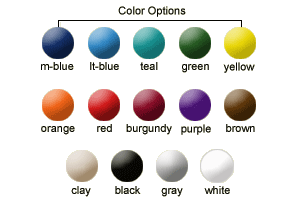 This coating creates excellent durability, a high gloss appearance, exceptional corrosion resistance, and also comes in many vibrant colors. Thermoplastic coated bike racks are coated with a matte polyethylene powder in a single layer, eliminating any surface scratches. The lower film build prevents runs and drips, and the powder-coating provides good edge coverage, excellent corrosion protection, and also inhibits the growth of microorganisms. Recycled Plastic is made with a minimum of 96% post-consumer/industrial materials, with additives to enhance color, stability, and other properties only adding up to a total of 4% of the product. It won't crack, splinter, chip or fade; is less flammable than wood; has a smooth, aesthetically pleasing feel; and will never rot or deteriorate. Recycled plastic also does not emit harmful chemicals into the environment that might pollute nearby surfaces and groundwater. Stainless Steel is a low carbon steel containing chromium, which gives the steel a distinctive stainless, corrosion resisting property. The steel can be polished to Satin #4 or electro polished for an extremely glossy, mirrored metal appearance. Its antimicrobial finish is extremely resistant to fire and heat, and is highly durable in harsh weather conditions. 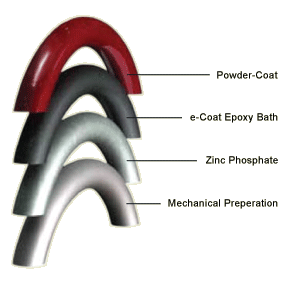 The e-Steele process is a state-of-the-art e-coating with an epoxy resin water-based paint. This produces an extremely durable, anti-corrosive coating that uniformly coats every crevice without runs, drips or other common coating imperfections. Epoxy e-coatings are also OSHA and EPA compliant, and produce little or no HAPs and VOCs. 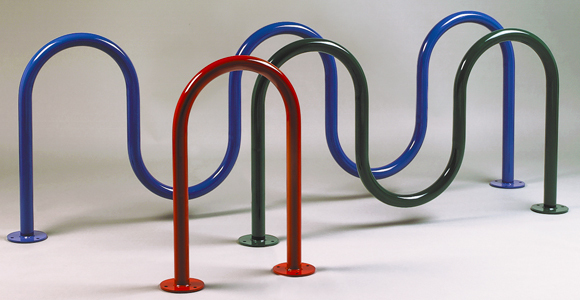 Inverted 'U' Racks, available in round tubing or square tubing models, are the most commonly used bike racks. The simple design allows the rack to be placed very close to destinations, giving bicyclists a convenient place to lock their bikes. Each single rack can hold up to two bikes for minimal parking or multiple racks can be lined to secure as many bikes as you need. 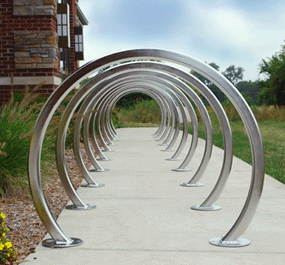 The fluid curves of Wave & Serpentine bike racks are recognizable by cyclists and assure safe, dependable parking. Both round and square models are compatible with U-Locks to lock both the frame and wheel for maximum security. 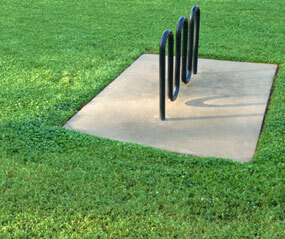 These bike racks can also be ordered with loops to fit as little or as many bikes a facility needs to meet regulations. Bollard Style Bike Racks can be used to limit access to bike-only trails and parking areas while also providing cyclists with secure parking. Robust and highly visible, bollard bike racks can be used as security and/or traffic barriers to help regulate large crowds. 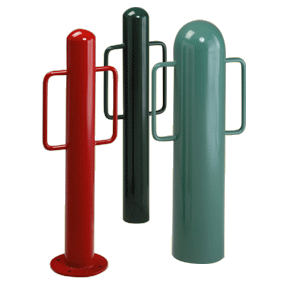 Bollard Bike Racks are available with one or two square or rounded arms, and come in various widths and styles. 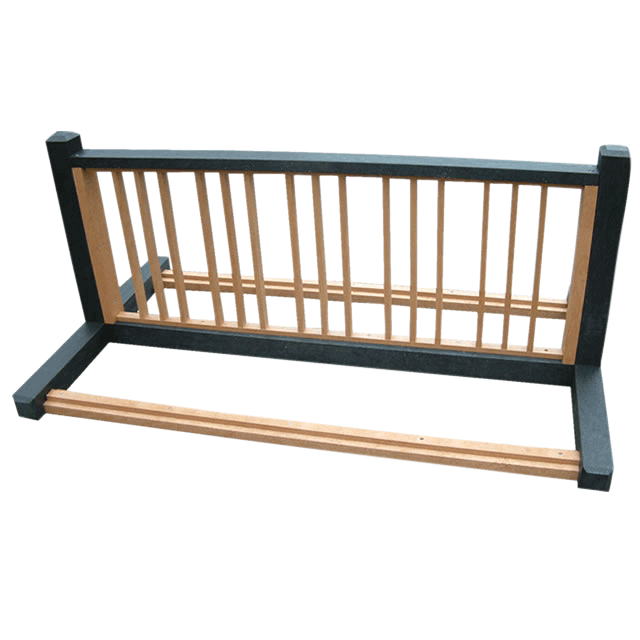 Grid Style Bike Racks are traditional, basic, and easy to use. The grid design is ideal for high volume bike parking, and most models can be ordered in single or double sided. These compact bike racks are recommended short term bike parking only. Other grid style bike racks include the Space Saver or the Recycled Plastic models. New variations on traditional bike racks offer extra security and character to any setting. Bike racks like the Triton™ and Orion™, put a twist on basic bike rack designs for added interest and maximum security. 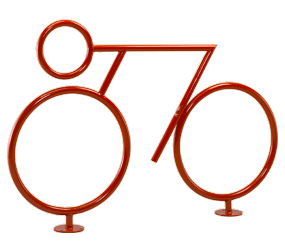 Add some personality to your environment with decorative bike racks. Imaginative and playful, these accents meet bike parking regulations while also adding to the aesthetic of its surroundings. Visibility: Avoid placing bike racks in isolated areas. 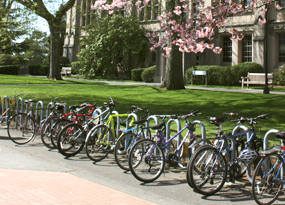 Bike racks that are placed in highly visible locations prevent theft and vandalism, and allow cyclists to locate racks immediately. Weather Protection: Depending on your bike parking requirements (Class I or II), weather protection should be implemented. Some existing structures that can be used to shelter your bike racks include overhangs, covered walkways, bike lockers, and trees. Spacing: Consider the space needed for a bike rack holding its maximum number of bikes, not just the rack itself. Also allow for adequate clearance around the rack to maneuver bicycles; account for access from both sides if bike rack is double sided; limit conflict with pedestrians, cars, and walls; and never block fire hydrants, doorways, or walkways. Suggested Spacing: A minimum of 30" of aisle space and 30" of handlebar clearance between racks and/or other structures is suggested. However, increasing clearance space is recommended if ample space exists. Proximity: Place the bike racks in a location near common places of interest like shopping centers, parks, office buildings, or any main attraction cyclists might be visiting. Bike racks that are placed too far from destinations won't be used.